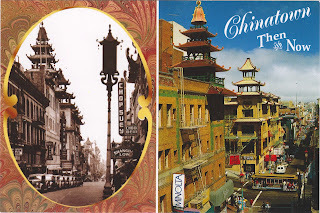 Outgoing postcard US-3373239 to Australia shows a then-and-now street view of the Chinatown ( 唐人街) on Grant Avenue in San Francisco, California. 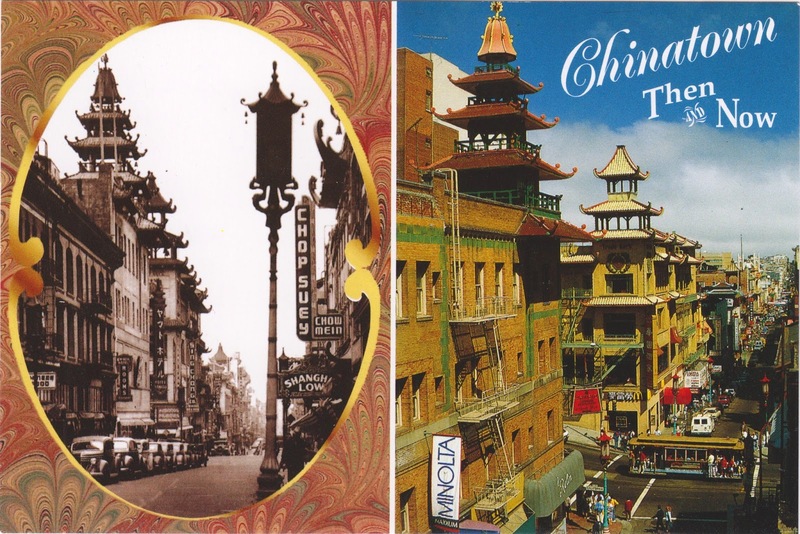 Establishment in 1848, it is the oldest Chinatown in North America and the largest Chinese community outside Asia. It is also a major tourist attraction with more annual visitors than those to the Golden Gate Bridge. 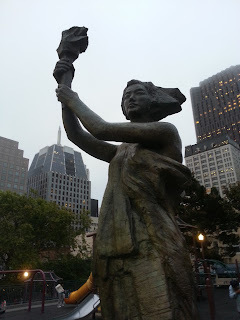 When I walked around the Chinatown a few days ago on May 27, 2015, I ran into a bronze sculpture at Portsmouth Square (花園角) on Kearny Street, where many "dancing grannies" were performing exercise routines called plaza dancing (广场舞), originally popular with middle-aged and retired women in China. It was a replica of the Goddess of Democracy, a statue created during the Tiananmen Square protests of 1989 in Beijing, China that was destroyed on June 4, 1989 by soldiers who took over Tiananmen square from protesters. Designed by Thomas Marsh and dedicated in 1994, the replica is 10 meters tall, same as the original, and weighs approximately 600 pounds or 272 kilograms. It bears the inscription, "Dedicated to Those Who Strive For and Cherish Human Rights and Democracy." Today marks the 26th anniversary of the Tiananmen Square Student Protest.